Lipids are esters of long chain fatty acids and alcohols. They are waxy or oily substance present in all living organism. They are non-polar (hydrophobic) compounds, soluble in organic solvents (chloroform, benzene, ether etc.). Fatty acids have a long hydrocarbon chain with a terminal carboxylic acid group. All lipids are formed of Carbon (C), Hydrogen (H) and sometime Oxygen (O). Small amount of phosphorus, nitrogen and sulphur are also present in some lipids. They are insoluble in water but soluble in non polar solvents like benezene and choloroform. 1. Major source of energy: Fats form the highly concentrated source of energy for man. Energy is released by the oxidative break down of fat if necessary. They are producing more than twice as much energy per gram as do the carbohydrates. 2. Food reserves: The neutral fats form the important food reserves in both plants and animals. In plants, they are stored in the seeds to provide nourishment for the embryo during germination. Eg: Oil seeds like ground nut, mustard, coconut and castor. The oil i extracted from the seeds is used for cooking and other purposes. 3. Protection and Insulation: In animals they are stored in adipose cells. Deposited beneath the skin and around the internal organs prevent the loss of body heat. They are act as shock absorbing cushions around the eye ball, kidney and gonads. About four percentage of the total body fat is reserved for this critical function. 4. 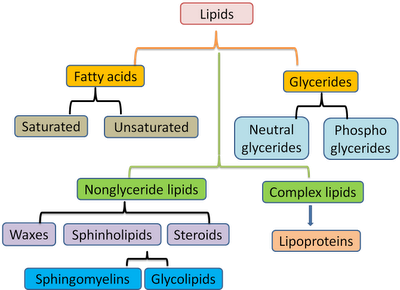 Cell membrane structural components: Phospholipids, Glycolipids and sterols form the important components of biomembranes. Some glycolipids are found in myelin sheath. Waxes form a protective coat on plant parts and animal furs. 5. Hormones: Cholesterol IS used in the synthesis of steroid hormones, vitamin D and bile salts. Prostaglandins are hormone like compounds derived from fatty acids like arachidonic acid (20:4). 6. Vitamins: The lipid soluble vitamins (A,D E and K) play a major role in the regulation of several critical biological processes, including blood clotting and vision. 7. Vitamin absorption: Dietary fat serves as a carrier of the lipid soluble vitamins. All are transported into cells of the small intestine in association with fat molecules. Therefore a diet that is too low in fat can result in a deficiency of these four vitamins.